The sensitivities of defect isolations in TIVA and OBIRCH measurements are sometimes affected by signal streaking. 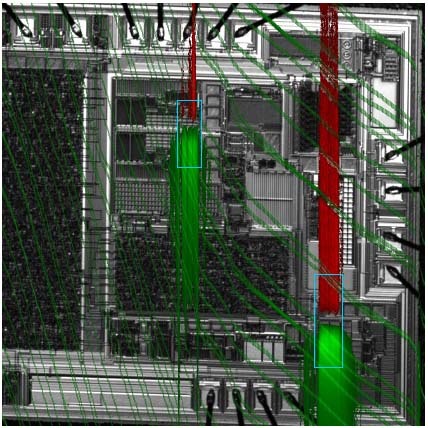 For instance, the streaking in the TIVA image shown in Figure 2828a (a) made it difficult to isolate the actual part of the defective circuitry. In order to obtain a better defect isolation, Pulsed TIVA was employed and then, the spots in the circle in Figure 2828a (b) directed the defective location accurately. In this measurement, the laser was pulsed and phase lock detection was applied so that the steaks were effectively reduced; therefore, the sensitive defect isolation was enabled. OBIRCH is also a DC-method, which sometimes limits the investigation of dynamically functional devices due to their time-dependent device function. For instance, Figure 2828b shows diagonal stripes, in an OBIRCH pattern, induced by the interference between laser scanning and internal device operation frequency. Those stripes were originated from overlapping of systematic current signals caused by dynamic current consumption. 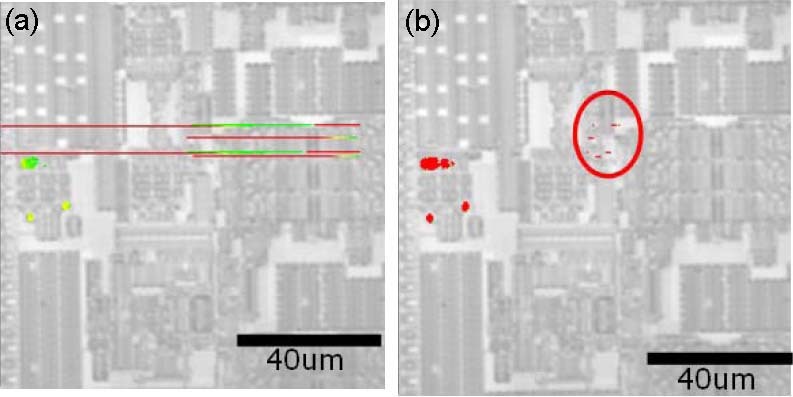 The vertical top-bottom tails in the rectangular box were originated from intermetal vias at high current density, giving strong, but not defect-related OBIRCH signals. Furthermore, the laser power is sometimes reduced substantially so that the artifacts can be minimized. From instance, in this way, streaking effect can be removed and thus, the defects can be accurately localized. Ravikumar V K, Ho M Y, Goruganthu R R, Phoa S L, Narang V, Chin J M, Combining High Resolution Pulsed TIVA and Nanoprobing Techniques to identify Drive Strength issues in Mixed Signal Circuits, 2010 17th IEEE International Symposium on the Physical and Failure Analysis of Integrated Circuits (IPFA). Peter Jacob and Félix Beaudoin, OBIRCH – Monitoring As A Reliability-Failure-Analysis and Screening Tool, ISTFA proceedings 2001 (ASM International), pp. 397-403.